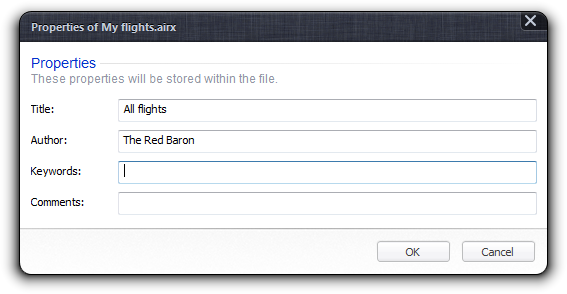 Flightmap handles your flight plans in files called itinerary, bearing the extension .airx. Flightmap can also import and export a wealth of other formats. When you launch Flightmap, the main window opens with an empty itinerary, or with the .air or .airx file you've doubleclicked. Menu commands are found in the left sidebar. If the main window is too narrow, the sidebar is automatically hidden to give maximum screen real estate to the itinerary. You can slide the itinerary to the right and reveal the sidebar by clicking on the “hamburger” icon at the top left of the menu bar. 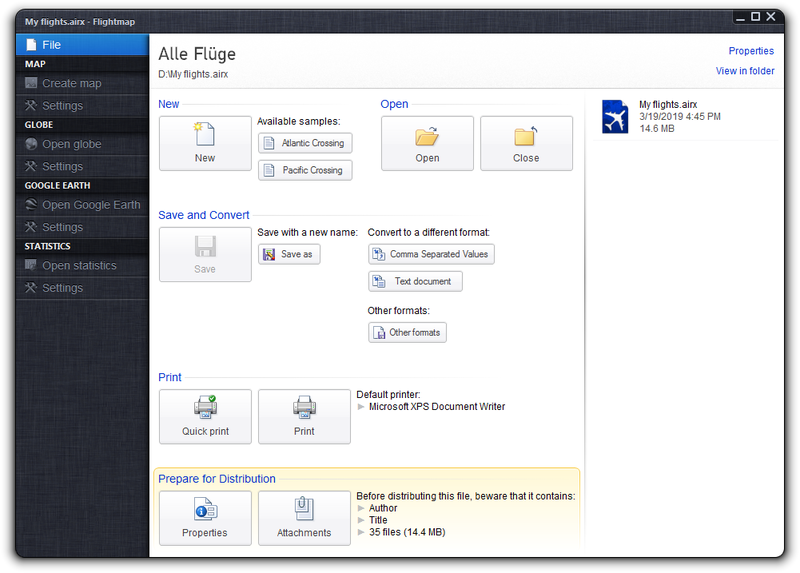 The “File” command in the sidebar opens a full-page file menu, with five command sections and a list of recently used files. In addition to create an empty new itinerary, Flightmap also offers two sample itineraries as templates: one crossing the Atlantic Ocean (Europe–America), and one crossing the Pacific Ocean (America–Australia). You can open existing .air, .airx and .csv files using the “Open” command. On the right, you find a list of the last 20 files you've opened with Flightmap. You can open a file from that list with a doubleclick, and remove a list entry by opening its context menu. The “Save” command saves the itinerary, “Save as” allows you to choose one of many file formats available for export. The most important ones are listed next to the “Save as” button. 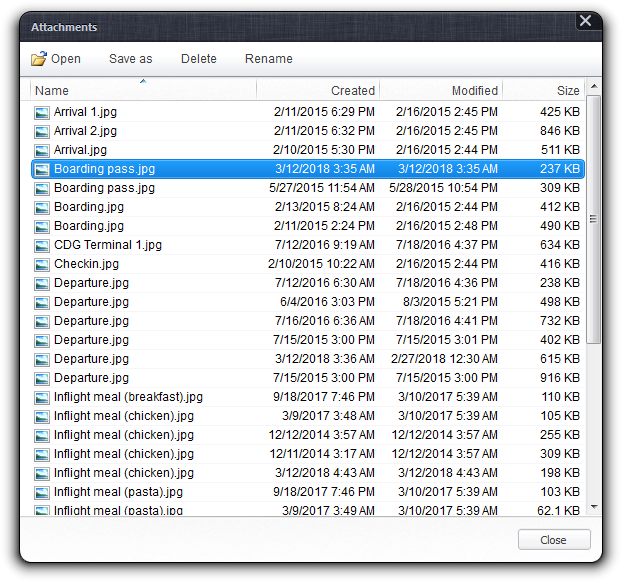 If the current itinerary is unsaved but modified, and you try to close it or to quit Flightmap, the application will ask whether you'd like to save the file first. This section offers the “Print” command to print the itinerary in a table format, with a selection of columns most likely needed on-the-go. 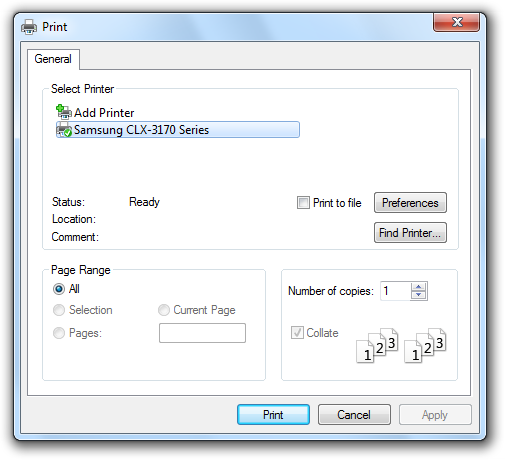 The “Print” dialog allows you to select a printer and different options like paper format first. 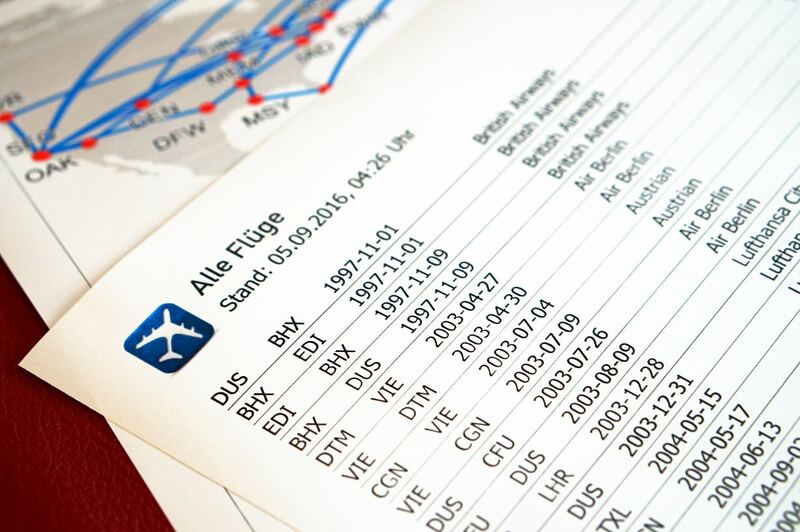 You can also choose to print the entire itinerary, or just the selected flights. “Quick Print” skips this dialog entirely, and sends the whole itinerary directly to the Windows standard printer. Printing requires the font “Tahoma” to be installed on your computer. It is distributed with Windows and installed by default. 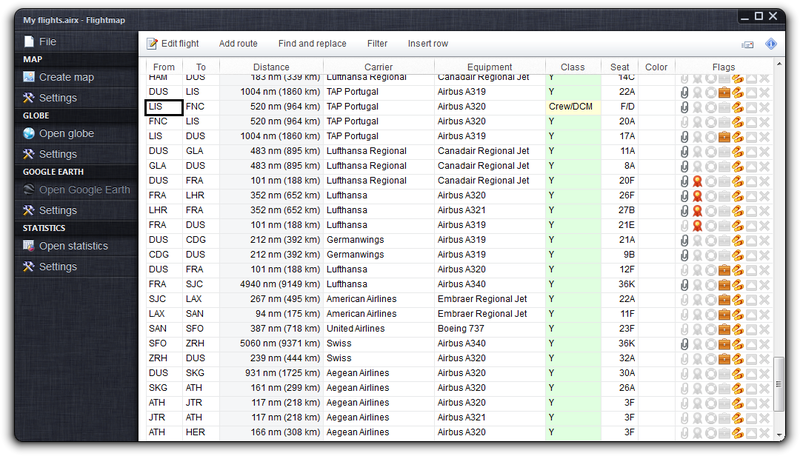 Flightmap itineraries may contain additional information, so-called “metadata”, and attached files. The commands from the “Prepare for Distribution” section allow you to review and edit this information before you publish or share your itinerary, as both can reveal personal information to any recipient. The “Properties” command opens a dialog where you can enter the itinerary's author, title, keywords and comments. This information can be used for bibliographic purposes. With Flightmap, you can attach files to flights. While this functionality comes in handy for various purposes, attached files may reveal personal information. The “Attachments” dialog lets you to browse the attachments of the entire itinerary, and delete or rename them. The dialog works globally, and is oblivious to the individual flights holding the attachments. You can find information on attaching files to flights here.